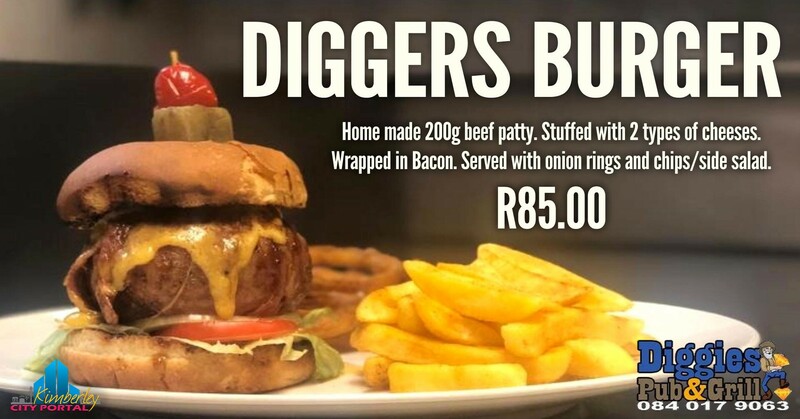 Diggers Burger, available from Saturday 6 April! Home made 200g Beef Patty, stuffed with 2 types of Cheeses, wrapped in Bacon. Served with Onion Rings and Chips/Side Salad. If you want to find it in Kimberley, you’ll find it on Kimberley City Portal. Kimberley and the Northern Cape’s Premier Business, Tourism, Restaurant and events directory. Kimberley’s biggest and most popular local business and events guide. Be found in Kimberley & The Northern Cape.